Email, to this day, remains a primary mode of communication with the customer in any organization. When you send mails to several customers via Recruit, it becomes increasingly difficult to keep a track of each individual's activity on your email. Did the customer open the mail yet? Did the customer click the links you had included? If an email has gone unopened, what could the reason possibly be? The answers to such questions on the performance of your emails will help you determine whether your efforts are in the right direction and also enable you to plan further emailing efforts. 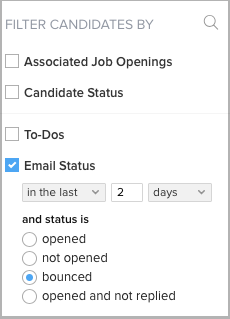 In your Zoho Recruit account, go to Setup > General > Email Settings > Email Insights. In the Email Insights page, turn the Email Insights feature ON. 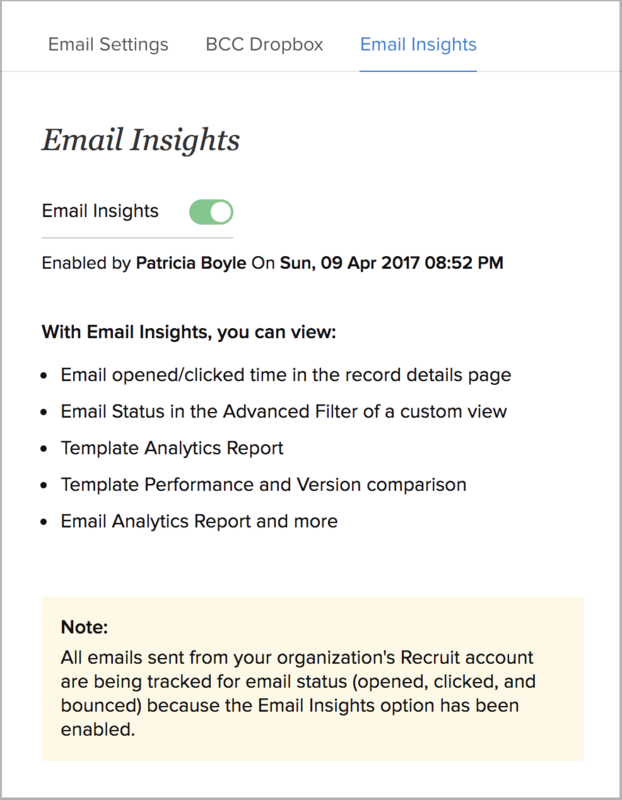 Email Insights are enabled in a Recruit account by default. The details of a particular customer's engagement with your email is available contextually. 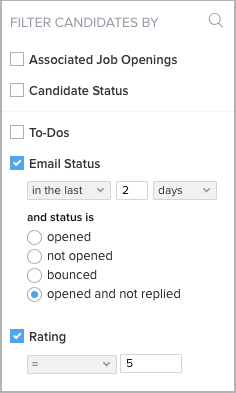 The status of individual emails can be seen under the Emails section of every Candidates and Contacts. Go to the desired module. Click the record for which you wish to view the email status. In the Record's Details Page, scroll down to the Emails section. After an email is sent, the status bar displays any of these four status messages. Delivered - The email has reached the recipient. Bounced - The email has failed to reach the recipient. Opened - The email has been seen, and opened. 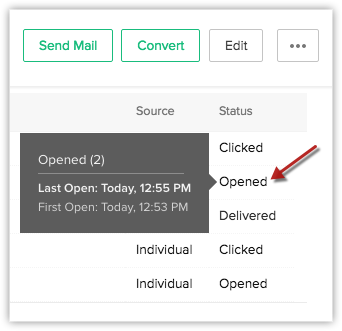 When you point your mouse to the Opened status, the following details about the opens will be displayed in an information box. Total number of times the mail has been opened. The first time the mail was opened. The last time the mail was opened. Clicked - Links in the email have been clicked. When you point your mouse to the Clicked status, the following details about the clicks will be displayed in an information box. The first time and the last time the mail was opened. Total number of clicks recorded in the mail. The first time a click was recorded. The last time a click was recorded. Delivered technically refers to only the absence of a bounce. So when an email has most definitely not bounced, it is assumed to have been delivered to the recipient. Zoho Recruit uses web beacon trafficking, the industry standard followed by email service providers for tracking emails. A small graphic (one-by-one pixel) is embedded at the bottom of the HTML emails sent from Zoho Recruit. When a recipient opens the email and chooses to Display images in it, this tiny image is downloaded from our server. 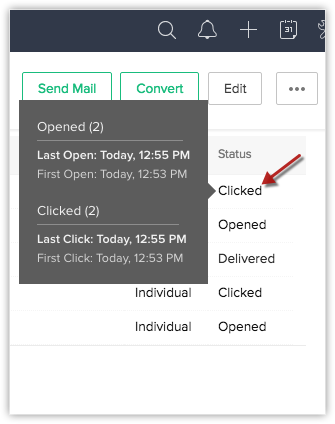 This download enables Zoho Recruit to track the opens and clicks on your email. Since this is an image, it can only be embedded in HTML emails. As a result, plain text mails cannot be tracked by Zoho Recruit. An open is recorded only when the recipient has chosen to Display images in the email. Otherwise the email will not be tracked. For a more accurate tracking, please request your customers to include your email address in their address book or make sure they choose to display images on the email. 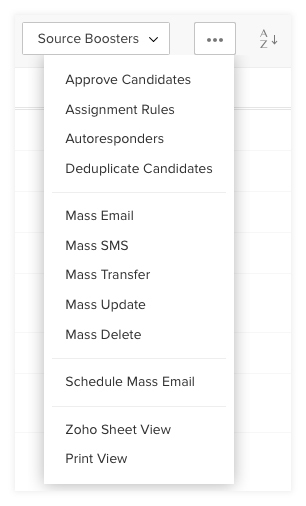 Zoho Recruit now lets you sort records based on associated sales priorities such as tasks, calls, events and emails besides the regular search parameters. 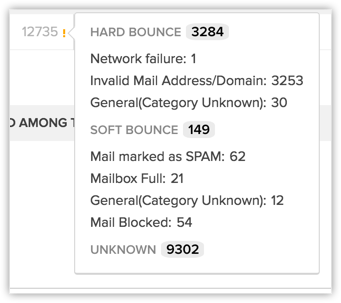 With Email Insights enabled for your account, Email Status is among the priorities based on which you can conduct the search. For example, using advanced filters, you can search for “contacts that have opened mails in the past 3 days”. Or “contacts to which mails have been sent but not opened this week”. 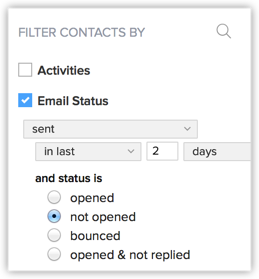 Take a look at a few scenarios in which Email Status is used as one of the search criteria in the advanced filters. Emails that have been sent to contacts in the last 2 days but not been opened. Emails that have been sent to candidates in the last 2 days and have bounced. Using this in combination with other criteria will yield even more valuable insights. For example, consider the following example. For which emails have been opened but not replied to. If this search yields results, you may want to make a second follow up on such Candidatess. To further drill down the search, you can enter a particular priority as well. Say Priority is high for a candidate who has been given a rating of 5.0, but email has not been replied. This way, you can attend to these Candidates first. You can apply instant actions on the records filtered using the advanced filters such as Mass Update, Mass Email, Macros and so on. This way, advanced filters open the doors for discovery of sorts when it comes to your Recruit data! With Email Status among the search criteria, the search only gets better. The Email Analytics report in Zoho Recruit offers you statistics to tell you about the performance of mails sent via Zoho Recruit. Email Analytics is the summary of email status based on date, template, module and user. Select the Email Reports folder. In the Email Reports folder, click Email Analytics. In the Email Analytics page, you will be able to choose the parameters by which the email statistics are to be filtered. For example, Date Range,Group and Users and so on. Summary Report: A summary of stats for the entire chosen period. Detailed Report: A detailed break-up of the summary report. The numbers in the Detailed Report add up to the total number presented in the Summary Report. The Email Stats are presented in the following columns under both the Summary Report and Detailed Report. Sent - Total emails that have been sent from Zoho Recruit. Bounced - Total emails that could not be delivered. 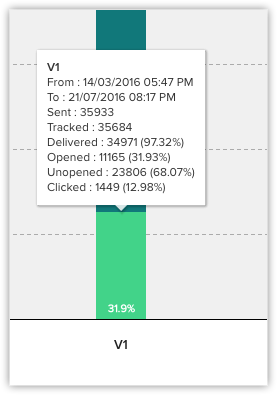 Tracked - Emails that are being tracked by Zoho Recruit to measure performance. Only if mails are tracked, Zoho Recruit will be able to ascertain if they have been opened or clicked. Usually, all emails sent from Zoho Recruit are tracked. Sometimes, when this is not the case, the number of emails under "Tracked" tells you how many out of the Total Sent mails are actually being tracked. Therefore, this number is less than or equal to the Total Sent emails. Opened - Emails that have been seen, and opened by the recipients. Clicked - Emails in which the recipients have clicked links. Received - Emails that have been received by sales reps from customers. Responded - Customers' emails to which sales reps have responded. An email will not be tracked if Email Insights has been disabled in Zoho Recruit. Only emails sent from Zoho Recruit are tracked. 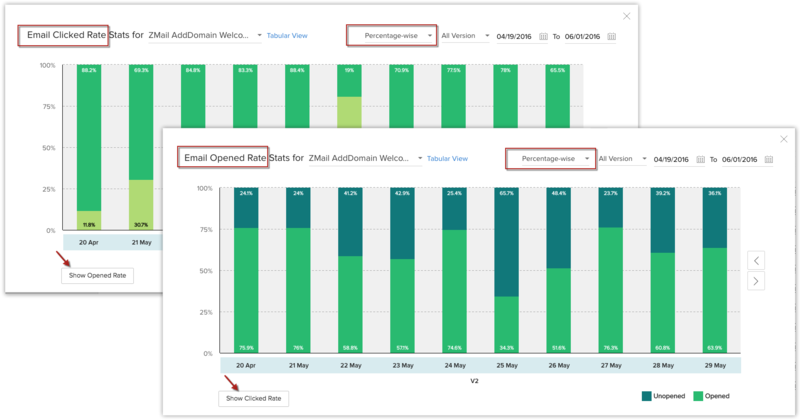 Template performance enables you to judge the performance of each template, and also different versions of the same template. 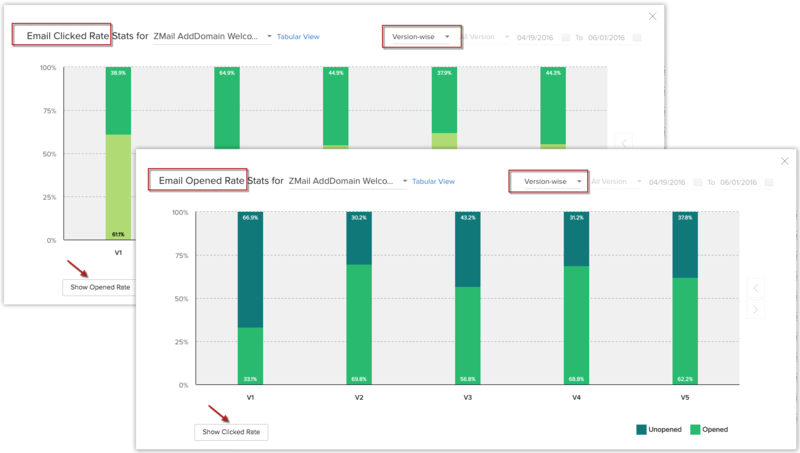 While you can see the open/unopened rates of a template, you can also delve into further detail and see how far minor or major changes in the template have affected performance. After each change, a new “version” of the template is created and each version has its own statistics. For example, say Zylker Inc has created a template named User Retention. Editing the subject of this template from “Zylker considers you important” to “You are important to us” might make a difference in the open rates. You can confirm that by checking the performance of both versions. In your Zoho Recruit account, go to Setup. Under Customization, click Mail Templates. In the Mail Templates window, you can see the complete list of email templates in various folders, under the Email Templates tab. Click one of the following icons from the column named Stats. - This icon shows the email open stats in graphs. Alternatively, you can switch between the Tabular view and the Chart view in the Stats window, to see both template stats and version history. Hovering with the cursor over each bar would open a tooltip displaying more details. You can adjust the date to check template statistics for a particular period of time. Also, you can search for a particular template in the Search tab of the stats window. 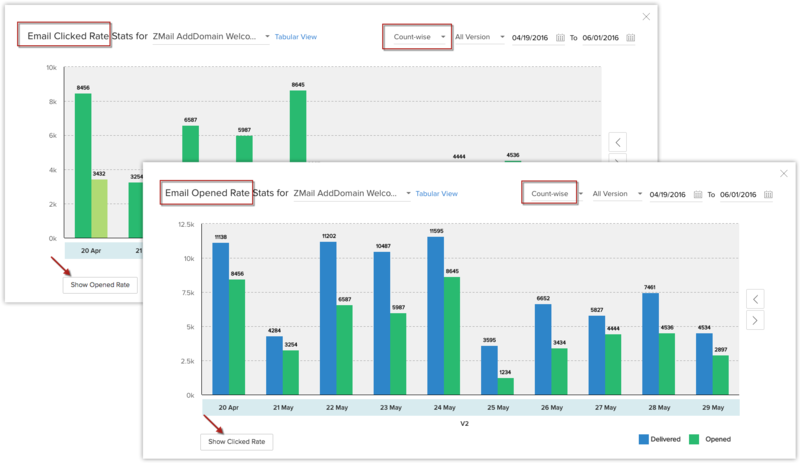 The Tabular view shows the performance of different versions of the same template, complete with information about the date on which the changes were made, and who made the changes as well as the comments entered by the user when the changes were made. This way, you can determine what changes to a template will help, and what won't. The reports view would be available only for users with Enterprise Edition.